Banyak in Indonesian means many and this is exactly what Pulau Banyak is. A group of 99 islands, 30km west of Singkil in Aceh. These islands are mostly uninhabited and offer fantastic beaches, great surfing , fantastic snorkeling and scuba diving over coral reefs and virgin rain forest which is rich with wildlife. Some of the islands do have very basic accommodation. Bungalows on the beach which can be perfect for that total getaway break. Ferries leave from Singkil a few times a week to the islands. Local boats leave Singkil Monday, Tuesday and Saturday to Pulau Balai - Rp25,000 and takes 4.5hrs. Depart in morning (rubber time). Boats return from Pulau Balai to Singkil Sunday, Wednesday and Friday. Car ferry leaves 10am Sundays and returns 10am Monday. Rp13,000 for passengers. Trip takes 4 hours. Pulau Bangkaru, the second biggest island in Pulau Banyak, sees Green Turtles laying eggs on it's beaches every night, all year round. Between November and March there are also a few Leatherback turtles laying eggs. Yayasan Pulau Banyak (YPB) is an organisation which is trying to protect these turtles from people poaching their eggs. The organisation has guards on the beach to prevent this from happening. Pulau Tailana is one of the smaller islands but has some of the best snorkelling available as well as the chance to see the dugongs. There are also a number of other islands close by for exploring by boat. These include Pulau Balong, Pulau Matahari and Pulau Ragu-Ragu. 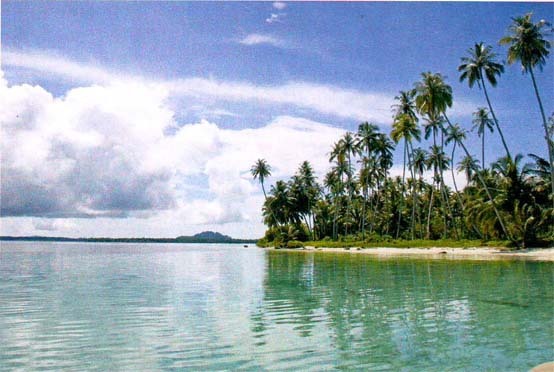 Banyak Island Lodge is located within the Bay of Plenty, surrounded by lush tropical rainforest. Banyak Island Lodge is an exclusive 8 guest facility catering for those looking for a surf trip with maximum surfing. The lodge has excellent surfing spots right in front of the lodge. For more information and pricing check out the Banyak Island Lodge website. Palau Palambak Besar is the fourth largest island in Pulau Banyak. Pondok Alam Palambak (PAP), northern shore of Palambak Besar. Ph: 0852 76503937 and 0812 263322839. Three bungalows with attached bathrooms. Rp75,000 per night. Pondok Bemda on the northwestern point of Palambak Besar. Putri, Jl. Iskandar Muda 43. Ph: 0852 7684 8855, 9 rooms, fan or aircon, no attached bathroom: Rp 40-85,000. Restaurant. Lei Kombih, Jl. Iskandar Muda 1, Ph: 0852 9689 5929 (some english). 5 rooms with fan, no attached bathroom; Rp 40-50,000Rp. Restaurant.